On July 25th 2015 we took part in the vernissage of the Gertrud Rittmann-Fischer Collection by the Foundation "Ritter von Böhl" in Deidesheim. Many were the artists of CKI and Gertrud's personal friends who were present at the event. 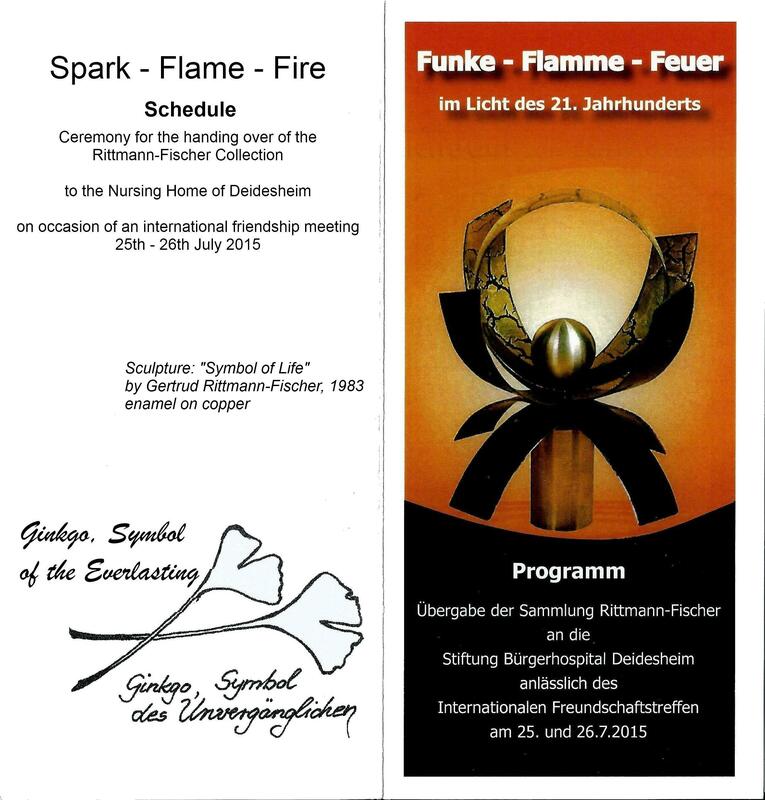 These are the discourses of thanksgiving to Gertrud by CKI Italy during the vernissage on July 25th and the greetings to Mr. Manfred Dörr, mayor of Deidesheim, on July 26th. This is the right occasion to give you 1000 thanks. Thanks for exposing Your precious enamel collection here at the Ritter Von Böhl Foundation. Thanks for giving birth beside to your children but also to the C.K.I. Thanks for teaching enamelling to thousands of artists. Thanks for the numerous humanitarian interventions, all the good and all the help that You gave and You never talk about. Thanks for giving your talent as a gift for us all: “If talented artists form new schools, later the schools will form new talented artists”. Thanks for showing us the way to go, accompanying us to St. Petersburg, Limoges, Florence and Deidesheim over less than 2 years. Thanks for teaching us to develop the culture of meeting and communication, to remove the walls, to open the doors wide and to build communication bridges. Thanks for leaving many footprints to follow during so many years of hard work. If just one person per country followed at least a part of your example, we would have an immense and everlasting CKI. The Italian members and I remain at your side. Here’s a little sign of our affection: a ring shaped like a ginkgo leaf for your next wedding anniversary. Dear Mayor Mr. Manfred Dörr. This has been the occasion to give 1000 thanks to Gertrud Rittmann-Fischer for the thousands artistic and humanitarian activities she made with and for the Creativ-Kreis-International. We have been taught by her to develop the culture of meeting and communication, to remove the walls, to open the doors wide and to build communication bridges. We also owe to Gertrud the exposition of her collection of artistic enamels by the Ritter Von Böhl Foundation. We Italian members of C.K.I. have firstly known and later loved the beautiful town of Deidesheim, not only thanks to the meetings at Gertrud’s home and the visits at the Ritter Von Böhl Foundation, but also to the receptions that you, Mr. Mayor, have organized here in this historical council room. In the name of C.K.I. Italy, we want to celebrate today’s meeting with a gift: a watercolour enamel, created by Italian artist Prof. Orlando Sparaventi, who is here present and hands it now to you. The work represents a symbol-image of Florence, the so-called “David of Michelangelo”. This has also been the symbol for the 23rd International Enamellers Congress. On that occasion, the C.K.I. held her international expo. Enamel is our meeting medium.